I will not take in any more birds! I have enough! I have no more room, money or time! That had been my mantra —all perfectly legitimate reasons, don't you think? They are valid, yet they don't hold up when I encounter a bird in such great need. I have been accused of taking in too many birds—a nice way of putting it, isn't it? What they are saying, of course, is that I'm bordering on being a hoarder. To that I reply that being a hoarder is not about how many animals you have—it's about how you care for them. A person can have only a few animals and be a hoarder; he or she can have many more and not be one. The difference? Care and attention. Hoarding is not about how many birds you have it's about how you care for them. We all know our limits and whether or not we have reached them. We know what kind of attention our birds require, what our vet bills are likely to be for a year, how much we spend on toys, food, cages, what our disposable income is—all of that. (If we don’t, we have some work to do!) If we are at our financial limits, are aware that any more pets will put us over that limit, and we still acquire them, then we are destined to become hoarders. No amount of attention or love will keep the cages, floors, walls, food dishes or toys any cleaner. And no amount of cleaning will give the birds any more attention. They are both necessary. People with multiple birds often must work—that’s just a fact of life. Little beaks need to be fed. If we are fortunate enough to be able to stay home, or work part time, we can keep up with all that work and still find time to give each the attention it deserves. If not, we must consider very carefully whether or not to assume the responsibility of another bird, no matter how well intentioned we are. Accumulated a large number of animals, overwhelming that person’s ability to provide even minimal standards of nutrition, sanitation and veterinary care. Failed to acknowledge the deteriorating conditions of the animals (including disease, starvation, and even death) and household environment (severe overcrowding, very unsanitary conditions). Let’s take a look at these issues. First, hygiene and nutrition. Birds are messy, aren’t they? They throw seed, push food and toys off counters and tables, and scatter cereal and food from the tops of cages as they fly by and jump from place to place—sometimes doing all of these just for fun! I spend several hours a day cleaning cages, surfaces, floors, food and water cups—the list goes on. More time is then spent cutting up fruits and vegetables for them, preparing pasta and filling cups with greens, just to have them squished under my feet as I walk on them. But none of that matters. They are getting what they need, and I’m happy that I can give them a better life than they had previously known. Birds require many different types of foods. Seeds are not enough. Fresh fruits, vegetables, greens, Avi-Cakes, Nutri-berries, sugar-free cereals, nutritious treats, pellets—they all should be a part of a bird’s daily diet. And they need vitamins and minerals in their diets to be healthy. Both cleanliness and fulfilling their nutritional needs are part of any bird owner’s responsibility. Messy as they are, all the work they generate—that is the price we pay for the love we give and receive from our feathered companions, no matter how we acquired them. Next, veterinary care. Excellent, qualified avian vets are often difficult to locate. If you are fortunate enough to be near to one, count your blessings. That person often means the difference between life and death for your bird. If not, make the effort to find one. Educate yourself on illnesses, diseases—everything you can about birds in general and your species in particular. 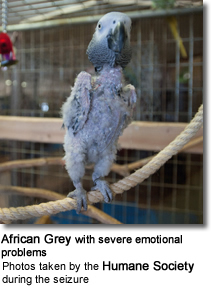 (Go on the AAV website to find an avian vet and obtain information.) Are avian vets expensive? Of course they are. They’ve not only gone to veterinary school, they’ve done post-graduate work in avian medicine, sometimes spending years studying with an avian veterinarian before branching off into their own practices. But that’s not the only expense. Think of the equipment these doctors have had to purchase in order to care for your bird properly. Then there are the overhead of the office and staff and the medications he must have on hand at all times. Like any doctor, he must pay for all of these things and eke out his own living as well. And just as any human doctor must, he has no choice but to pass these costs on to his clients. Most will make their charges fair so that they do not over-charge their clients. You alone can determine if the vet overcharges and if his charges are worth the care you receive. If you think that you might be a hoarder, or on the verge of going in that direction, ask those who know you if they think you are. If so, get some help with this problem and find homes for some of your animals. If not, you will have to determine how you deal with people who seem to think that anyone who has more than one or two animals is a hoarder and put you on the defensive when you are discussing your birds. People who know me know I have more than one bird; yet, people I meet or who have not seen me for a while seem to get some odd satisfaction out of finding out just how many birds I have so that they can stare at me, wide-eyed, repeat the number, and then insinuate that I am a hoarder. My reply now is, “Let’s just say I have a few birds.” That usually ends the inquiry. 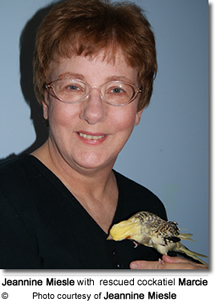 Close friends, and those who also rescue or adopt birds, are the exception. There’s no judgment there—only understanding and care. The cockatiels I have adopted have been in dire straits. 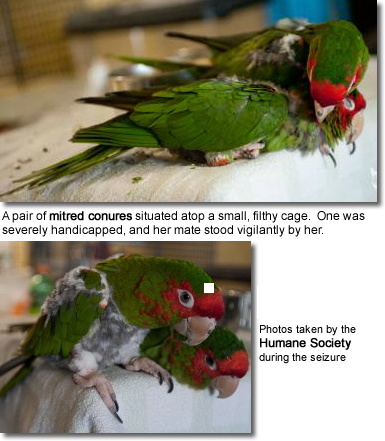 A bonded pair lived with three heavy smokers in a tiny, horrible cage, with only cheap parakeet seed to eat. Another lived with an elderly woman who just doted on him; unfortunately, she fed him mostly cheese and crackers (an indicator to me that her own diet was sadly neglected). She had to go into a nursing home, but had given him so much love that he was extremely affectionate—not a candidate for a large rescue organization. He would have withered and died under such an abandoned circumstance. One had lived with a college student whose girlfriend had given the bird to him. He received no attention. The latest had many health issues, was close to death when I adopted her in the summer of 2010 (see www.beautyofbirds.com/marcie.html.) There are also several with damaged wings or legs. One pair, unable to fly, were forced to endure bullying from others in the aviary and fight for every scrap of food they could obtain. No matter how well intentioned some people may be, at some point, if they keep acquiring animals, they will be in over their heads - financially, energy-wise and time-wise. This is when a loving caregiver transitions into a hoarder. Now each has his or her own roomy cage, with plenty of nourishing food, an abundance of toys, swings, spirals and play areas to explore, a great deal of time out of the cage, and copious amounts of love and attention. The handicapped birds have platforms on which to rest. I can’t take them all in, I know, but if I have the time and energy to care for them, and the occasion arises in which they will either come to me or go to a person who is already overloaded or to a shelter or rescue aviary, I will take them in. I have limited myself to cockatiels due to the room and cage size they require. Mostly though, this choice is a result of my passion for cockatiels. So, am I a hoarder? Of course not. I have thirteen birds. To some that seems like a few—to some, many. I will know when I can no longer care for my sweet birds. The joy I have received from these little ones is immeasurable. The time, energy and money are negligible compared to the love and companionship they bestow upon me and the satisfaction I derive from knowing I have improved their lives and circumstances. They have allowed me to finally know my purpose in life: to care for those whom no one else wanted. When I put an animal’s needs ahead of my own, I am much the richer for it. They have taught me (after too many years not understanding this concept) that there is really very little in life of true value: one’s family and home. And these birds are indeed family, aren’t they? Everything else is trivial. So what is our reward for all the time and care we give and money we spend? A song, a chirp, a kiss, a scritch on a soft, feathered head. That’s enough, isn’t it? Many thanks to Denise Kelley of the Animal Welfare Coalition for permission to reprint the definition of a hoarder. For more information on hoarding, go to http:/www.tufts.edu/vet/cfa/hoarding/. Animals Hoarding: What Can We Do?